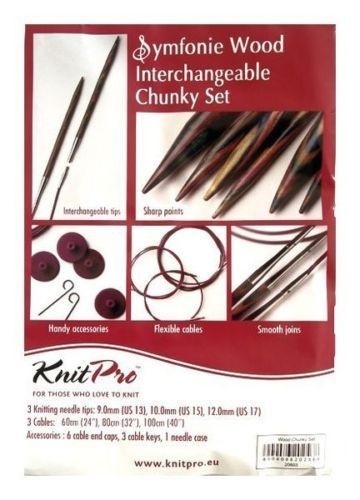 KnitPro Symfonie Wood Interchangeable Chunky Knitting Needle Set. KnitPro Symfonie Wood Interchangeable Chunky Knitting Needle Set.<br> pairs of interchangeable knitting needles sizes 9.0, 10.0, 12.0 mm<br> <br> cables: 60cm, 80cm, 100 cm<br> <br> 6 end caps, 3 cable keys & one see through needle case<br> <br> The needles are made from high quality colored wood and are individually marked with the needle size. The needles are made from high quality colored wood and are individually marked with the needle size.